It's Christmas Eve, that day of the year when all families get together, turn on the Christmas tree lights, gather around the laptop, and binge the best Christmas-themed TV episodes of all time. So what makes an archetypally great Christmas TV episode? It starts with winter. Not just the season of winter, but the tone of winter. It's dark, cold and lonely. But then, just when things look the bleakest, something breaks through that darkness. It could be the jingling of sleigh bells or a Star of Wonder shining in the sky or a thoughtful gift that, for a moment, makes everything right. It recognizes that, in this crappy world of soot-soaked slush and shopping mall parking fights and burnt Christmas cookies and greedy screaming kids, there are brief moments of love and joy. Not every great Christmas TV episode is on this list, of course. No "Christmas Party" from The Office or "An Echolls Family Christmas" from Veronica Mars. Sorry, you don't get everything on your wish list. You'll have to be satisified with just a few of my favorite helpings of Christmas TV stocked in your binge-watching stocking. In Lost's best episode, Desmond Hume desperately hopes a call to his long-lost love is not answered "new phone who dis?" My favorite TV episode I’ve ever seen, The Constant at once makes takes Lost to its most science-fiction strange and its most raw and emotional. On the strange mysterious island, due to an explosion of electromagnetism, Scotsman Desmond Hume finds himself “unstuck in time” his consciousness helplessly flashing back and forth between the present and eight years ago, when he self-destructively destroyed the relationship with the love of his life, Penny. But all those accidental time-travel flashes have a side-effect: Eventually, they’ll cause an aneurysm, killing him. Resident twitchy genius Daniel Faraday informs Desmond that he needs to connect with a “constant,” one person in both the past and the present that he’s connected with emotionally. It’s a physical manifestation of the desperate yearning, sense of loss and fearful uncertainty that comes with a long-distance relationship that’s gone bad. It captures that feeling when you want to be with her or him so badly, but think you may have screwed up things forever. You especially feel that around the holidays. And so you make one last desperate plea of raw emotion, and hold onto hope like a fool. You just pray like hell she picks up. And then, eight years later, on Christmas Eve she picks up. And the violin music swells and he tells her where she is, and they’re laughing and crying, and there are the lights of a Christmas tree in the background. And the connection is bad, but it doesn’t matter. “I’ll find you, Des,” she says. And they tell each other they love each other and promise to find each other, and all the stupid stuff in Lost’s final seasons doesn’t matter, because we got that moment. Christmas can be about love, about forgiveness, about reconnecting with what we’ve lost. Watch it on Netflix, or watch this song from Previously On Lost tribute band to get a musical recap. Oh, how the British love their Christmas specials. And so it is with Doctor Who, which, over the years, has had the time-traveling Doctor pitted against a villainous Snowman, a crashing Titanic Spaceship, Dream Crabs that give images of Santa Claus, and a giant Christmas spider. 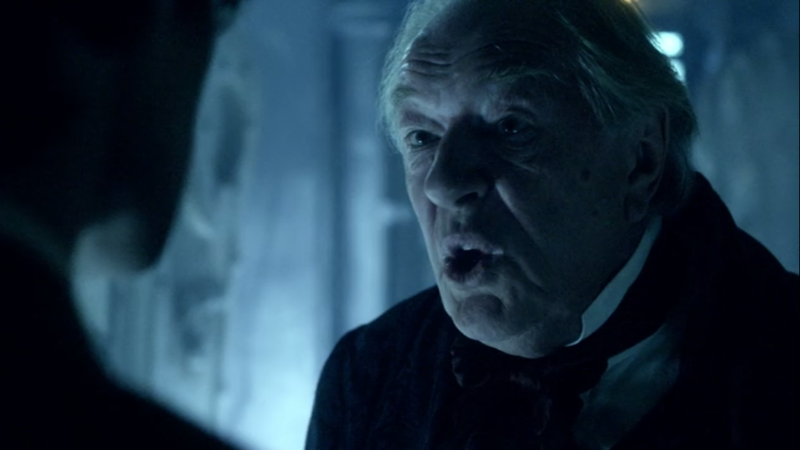 But one of the best episodes of Doctor Who, period, and quite possibly the best story given to Matt Smith’s 11th Doctor, came during the 5th season, and riffs on a very old story in a fresh way: Kazran Sardac (Michael Gambon playing a sci-fi Scrooge as only old British actors can) threatens to let a spacecraft crash into the planet rather than land, seemingly purely out of spite. At its worst, Doctor Who would solve a problem like this with a blur of technobabble, corridor-running, sonic-screwdriver waving, and convoluted time-travel paradoxes. Not this time. Instead, Doctor Who lifts the essence of Dickens’ Christmas Carol: To change the course of events, you must change a man’s spirit, not a man’s circumstances. He travels into the Kazran’s past, following the young Kazran’s relationship with Abigail Pettigrew (Katherine Jenkins), a terminally ill, cryogenically frozen woman, unfrozen once a year, on Christmas eve. But a point comes when Sardac realizes that if he lets her out one more time, she would live that day and no longer. So he keeps her frozen. Until he has to decide to let her out, and let her go. The Doctor’s mission: Thaw Kazran’s frozen heart, so much so he’ll be willing to thaw out the woman he loved, and lose her forever. It works as a wonderful counterpoint to The Constant: What happens when you have to make the choice to ultimately lose the woman you love on Christmas? There is technobabble, yes: But only to make the ultimate save-the-day solution the performance of a literal Christmas carol. Watch it on Netflix here. Compared to most Doctor Who episodes, it’s relatively easy to follow even if you can barely tell your Zygons from your Sontarans. This story cannot be found in Scripture. Maybe in the Gnostic gospels? Family Guy was always so smug about its offensiveness, as if crossing taboos was, in itself, comedic. There was a nastiness to it. But American Dad, also from Family Guy’s frat-boy of a creator, understood that the taboo was the hardwood floor that you dance on, but you still have to dance. So it is with Rapture’s Delight, with begins with much of the world being taken away to Heaven in a Left Behind-style rapture. And from there it gets crazy. I loved it so much I devoted an entire column to it five years ago. Stan’s wife, angry at him for his selfishness, leaves him and starts dating, well, Jesus. It gets weirder. There’s a seven-years-later transition, revealing the rubble and rabble of a post-Armageddon world — a mash-up of Mad Max and Escape from New York. With a hook for a hand and an eye- TiVo-Worthy patch, Stan’s become a grizzled Snake Plisskin homage. It gets weirder. Stan and Jesus have a climactic gun battle with the Antichrist (outfitted in a red suit and upside-down crosses, like an Adam West Batman villain) in the bowels of his United Nations headquarters. In the end, Stan takes a bullet for Jesus, so his ex-wife can be with the one she loved — Jesus. Blasphemous? Sure. But it’s the naive slightly sweet kind of blasphemy, not the vicious kind you’d find on Family Guy. It’s written by Chris McKenna, who also penned some of Community’s best episodes. ACHIEVEMENT UNLOCKED: "Wings and a Prayer." Yes, over the years there have been plenty of parodies, takedowns, mockery, and nit-pickery (How exactly did a smokin' hot Buffalo Gal like Mary turn into a spinster librarian?) of It's a Wonderful Life. In a way, it follows the formula for greatest Christmas episodes: It’s a Wonderful Life gets very, very dark before giving us a beautiful miracle at the end. And the secret is Jimmy Stewart, who plays desperate and tenacious – especially when you think he’s licked – better than almost anyone. He’s righteously angry and frustrated and beaten – this is a man who thought he was doing the right thing but got nothing but a drafty, rickety old house and a dead-end job and some annoying kids who keeps playing the same song, over and over and over. 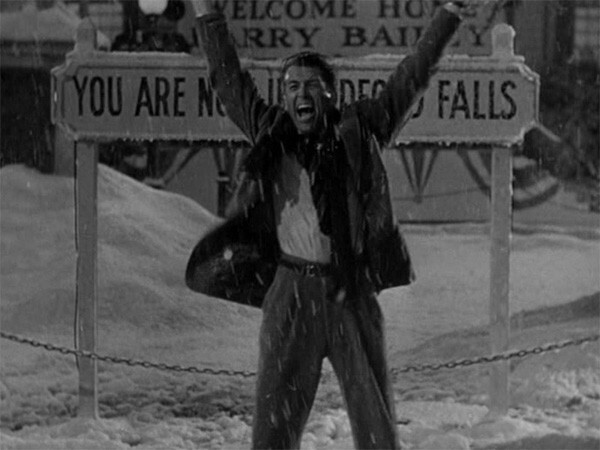 Stewart’s unburdened glee as he runs past Bedford Falls (“Merry Christmas, you wonderful old Building and Loan!”) is a marvelous homage to Scrooge’s Christmas morning awakening and his Frank Capra at his best. Clarence earns his wings – and Capra earns his cheese – by first putting George Bailey through hell to better understand the elements of heaven. This is a feel-good Christmas movie with a suicide attempt playing a central role. That’s some heavy stuff. Statistics show that suicides are actually the lowest during December, despite the lousy weather. And maybe because, like It’s a Wonderful Life, the holiday season is when we feel the presences of our friends and family the closest. It doesn't fix our depression, but it gives us just enough hope to keep trudging onward. In one magical Christmas miracle, back in 2004, The Simpsons was good again. Very few shows last 15 seasons, much less produce good TV episodes. Many critics argue that the golden age of The Simpsons ended around season eight. So seven seasons later, a lot of people had discounted what the show could do. I grew up without a TV and, as a kid, my parents didn't want us watching The Simpsons. (That Bart Simpson was so disrespectful, my parents thought, always telling adults to eat his shorts.) So this episode was actually one of the first Simpsons episodes I ever saw. And I kind of loved it. This was the first episode I wrote where I really felt like I “got” the show. I had been working on the staff for a little over a year when I wrote this one. 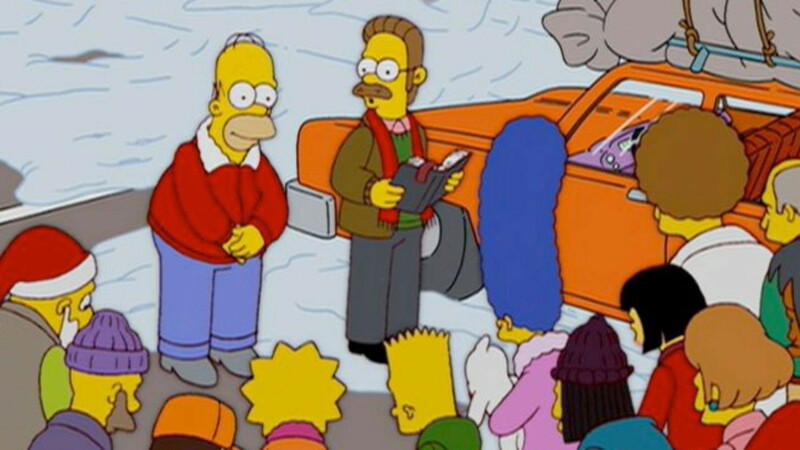 My first script that I wrote was also in Season 15, called “My Mother The Carjacker” (about Homer’s Mom). I wrote it two-thirds of the way through our Season 14 production season and my first draft was heavily (and rightfully so) rewritten by our showrunner Al Jean and the rest of the staff. When it came time for this script, I had been around long enough that I felt like I finally knew how to write for the show. The story was not my pitch, however. This was one Al suggested to me and I worked out the story beats with him and the other Executive Producers Matt Selman and Ian Maxtone-Graham. But once I turned in my draft, I was happy to see that not as much of it got tossed out and changed as in my previous script. It still went through major rewriting and punching up, but a lot of my original stuff remained. This one was dear to my heart because I’m a huge fan of old Christmas specials. So it was fun to just toss in parodies of all of my old favorites, such as “Santa Claus Is Coming To Town” and, especially, my all-time favorite, “Mr. Magoo’s Christmas Carol." I also was happy that my Christmas-themed parody of “Convoy” made it all the way to air. Other than that, I greatly enjoyed working on this story that let Homer be completely selfish and inconsiderate, but then turn around and mess things up all over again by becoming too altruistic. And I had a lot of fun with Homer and Flanders' “good guy off”. I wrote that speech in my first draft and it made it all the way to air pretty much unchanged. I’ve written 18 episodes of the show in all my time here and I still consider that my finest moment as a Simpsons writer. A classic Christmas lesson: Never make a giant Candy Cane truck angry. Thanksgiving may be Bob Belcher’s favorite holiday, but Bob’s Burgers can do a darn fine Christmas episode as well. A homage to Steven Spielberg’s “Duel,” where the Belchers face down a terrifying truck that looks like a giant candy cane? More frightening than the series’ Halloween episodes, and filled with hilarious Bob’s Burger lines (“All batteries die, but this one truly lived!”) Christmas in the Car gets at the truth of where most of our genuine terror comes from during the holidays: winter driving. 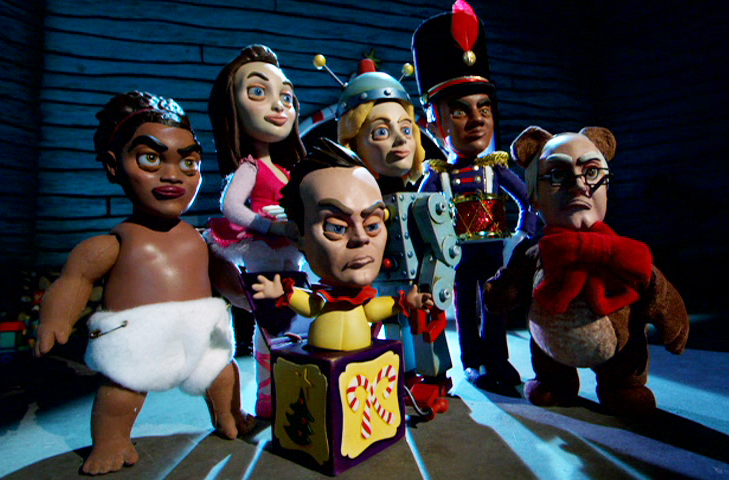 In its second (and best) season, Community uses a psychotic break by pop culture obsessive Abed (Dani Pudi) as a thin excuse to turn the show over to a homage to Rankin Bass’s stop motion specials (Rudolph the Red-Nosed Reindeer) Even the opening titles are redone in a Christmassy stop-motion style. This sort of gimmick doesn’t always work (see season five’s painful G.I. Joe episode) but the sheer amount of effort and attention to detail from showrunner Dan Harmon means the conceit doesn’t get in the way of the pacing or jokes. Mostly, the conceit works because of its ending, which reveals Abed's mother had given his this note: "Abed, I can't make it this year. I have a new family now. You'll meet them one day. You're a man now. Take care of Dad. Wash your dooper." But then, true to form, Community finds the idealistic, sentimental counterpart to its cyncism. Christmas is about family, yes. But family, as the The Fast and the Furious crew could tell you, can just as easily be your friends. And Christmas, Annie Edison says in the episode's climax, is "the crazy notion that the longest, coldest, darkest nights can be the warmest and brightest." There's Community in a nutshell. Harmon was rewarded for his ambition: The stop-motion company he started produced “Anomalisa,” a stop-motion animated film written and co-directed by Charlie Kauffman. It’s out next week. Take that, Charlie Brown. You’re a good man, but good grief, at times you can be a bit dull. 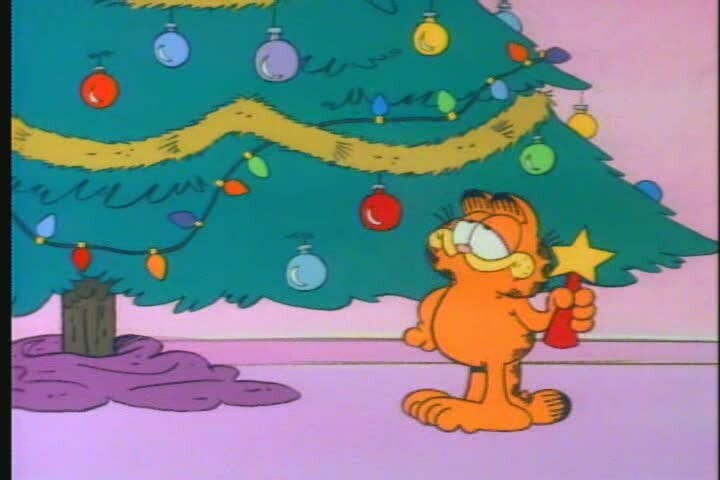 A Garfield Christmas Special was the other Christmas cartoon staple in our family. And in some ways, it’s better than Charlie Brown. It’s a bit better paced. It’s a bit funnier. And where Charlie Brown’s Christmas Special speechifies on the official religious Reason For the Season, Garfield better understands the actual experience of Christmas, which means dealing with irritating relatives and being caught in the tension between wanting to get and wanting to give. Garfield even keeps his lasagna and Monday jokes to the minimum, because it’s Christmas. Watch it now on the VHS tape that recorded an old TV up at my Grandma’s house. Come on! She’s made her famous grandma cookies and everything. We lost Lost and Heroes, but we also gained a fair amount this year. Lost has never been done before. And it will never be done again. It only took two episodes of American Dad to dismiss the show as a Family Guy re-hash. But it's long since surpassed its predecessor.